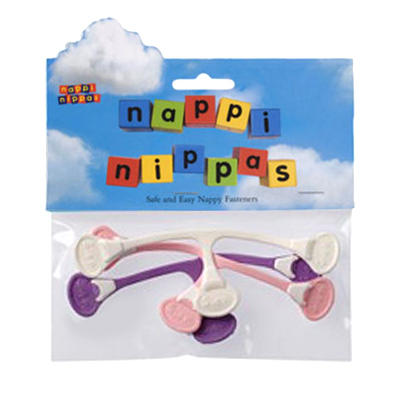 No need to attach prefolds, terries, muslins or shaped nappies with pins – use the Nappi Nippa by hooking one side, then the other and then down in the centre for a snug, leakproof fit. The Nappi Nippa is such an amazing invention, making safety pins a thing of the past. The T-shaped device has grippers on the underside of each edge to grab the cloth and hold it in place. While they appear sharp, they don’t damage the nappy or your baby and can’t be undone by little hands. We recommend using the Nappi Nippa with the prefold newborn fold for the best protection from newborn poo leakages. 3-pack, available in bright (purple, red, blue) or pastel mixes – please let us know if you have a preference.